THE PHANTOM OF THE OPERA (1989): A Nightmare At The Opera – Schlockmania! Andrew Lloyd Webber’s Phantom Of The Opera musical was all the rage during the late ’80s so it was inevitable that an enterprising schlock producer would crank out a modern version of the Gaston Leroux novel that inspired it to capitalize on its success. Ex-Cannon honcho Menahem Golan was the first one to do so – and the resulting version of this old warhorse represents an unusual but mostly successful marriage between gothic horror atmosphere a la Hammer Films and ’80s-era, makeup FX shocks. 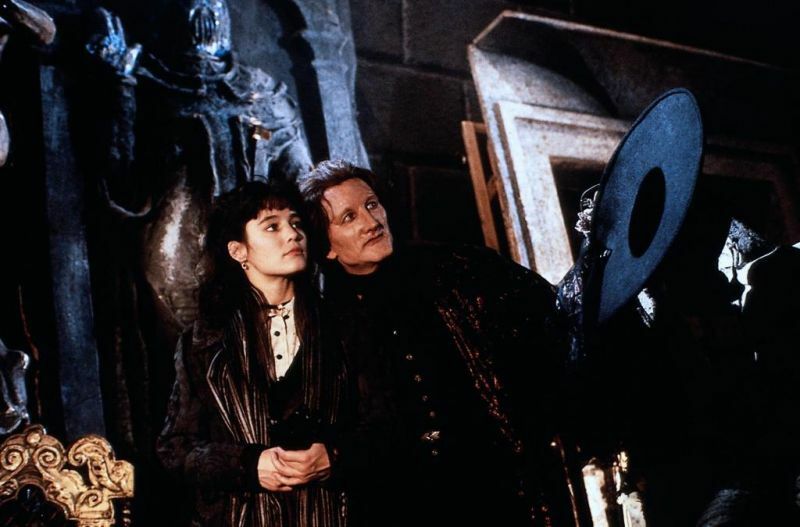 The 1989 Phantom Of The Opera draws more from the novel than from past film versions but also adds in its own quirky modern-day framing device. Christine (Jill Schoelen) is a music student who performs an aria by forgotten composer Erik Dessler for an audition. When a stage mishap cause her to be knocked unconscious, she awakens in late 1800’s London. She has apparently become an ancestral version of herself as she immediately resumes her place in the chorus of an opera called “Don Juan Triumphant”… the very opera she was singing in the present day. Olden-times Christine has an unseen benefactor who coaches her on singing from the shadows. She thinks he is an angel sent from heaven by her deceased father but he is actually Dessler (Robert Englund). He is thought to be dead but lives in the sewers beneath the city, disfigured from a deal he made with the Devil for musical skill. He aims to make a star of Christine and is happy to murder anyone that stands in her way – but he also wants more from her than she could ever imagine. 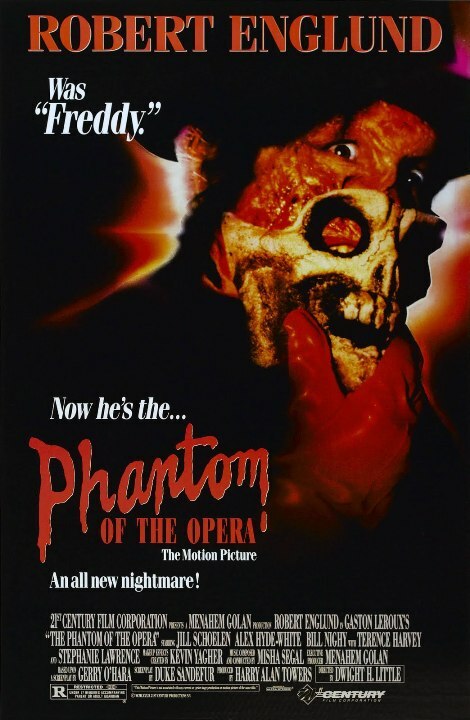 This version of The Phantom Of The Opera throws off some viewers because it offers a vertiginous mix of old-fashioned style and 80’s era shocks: one minute you’re being wowed by lavish costumes and locations, the next minute you’re cringing as Dessler slashes up people and does do-it-yourself skin grafts in loving close-up. Englund is even given a few Freddy-style quips here and there but thankfully that is kept to a minimum. The modern-day framing device also has a memorably gonzo payoff that tosses concepts of kismet and reincarnation into the mix, along with a memorably gruesome makeup effect. As unwieldy as that mix might sound, it plays out quite well here. Director Dwight Little and screenwriter Duke Sandefur have gone on the record saying they wanted the film to be an homage to Hammer films and they succeed: the mixture of lavish sets from Golan’s production of The Threepenny Opera and historical Budapest locations give it the delicious, antiquarian feel of a Hammer period-set horror and Little goes for grandiose, gothic touches at every step. He hits a blend of stately imagery and vigorous pacing that fuses the old and new in a way: the results will impress horror fans who appreciate the broad range of the genre’s history. Little’s direction is aided nicely by a lavish orchestral score from Misha Segal and sumptuous photography from Elemer Ragalyi, both of which enhance the film’s lavish production values. As for the gore effects, well, people often forget how shocking Hammer Films were in their time – this version of The Phantom Of The Opera simply bumps the grue up to 1989 standards. On that note, Kevin Yagher deserves praise for the film’s complex, convincing and oh so disturbing Phantom makeup. The performances add to the fun. Englund gives a full-blooded lead performance: he dips into camp at times but his excesses live up the film’s wild style and the sheer joy he takes in his work will charm grown-up horror kids. Schoelen makes for a compelling scream queen: it’s a little odd to see this actress, known for her half-chirp/half-rasp speaking voice, lip-synching to classical opera vocals but she gives the singing scenes an impressive level of gusto. Elsewhere, there’s some fun scenery-chewing from a young Bill Nighy as an opera owner and solid work from Alex Hyde-White as Christine’s would-be suitor. 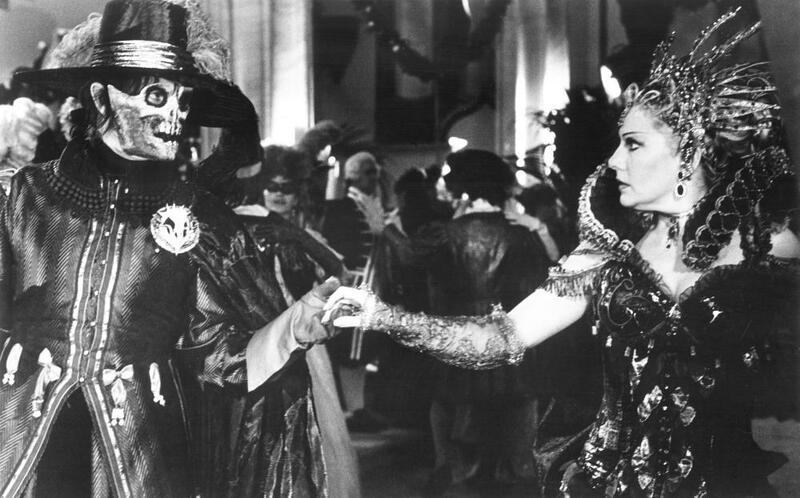 To sum up, the offbeat blend of elegance and grue in the 1989 version of The Phantom Of The Opera is actually an asset. For the adventurous horror fan, it’s one of the most unique versions of this oft-told tale and offers plenty of macabre delights in high style.